It's Penn State Football Time! Time to get nervous. A comment from Rich in the post below (about PSU parking lot rules) reminded me of why I don't always love the first game of the season. The big unknown is always the Parking. My whole tailgating life I tailgated in either the ancient "blue" (back when there was only blue and yellow) or (the first, purple, and pink) reserved lots - up until 4 years ago. That year we switched from the pink "reserved" lots to the general "parking" lots. In the Pink lot, we'd be the only vehicle in the area for the first hour - and, because people were arriving at all different times, our tailgate always had to be mobile - As I've written before, our tailgate got run-over, and our car(s) were hit twice as well. In non-reserved parking, when you pull into that parking spot, barring some type of emergency, you're in. Everyone sets up their tailgates and gets about the business of celebrating our fine university and Penn State Football. Sure there's the occasional disagreement between inhabitants - but, for the most part, it's just a great atmosphere. That is, once you get over the stress of parking. PSU has rules - rules about how the cars are supposed to be spaced - rules about canopies, beverages, noise, fire, etc. Some rules they choose to enforce (ie, open flames - if they can catch you) - some they occasionally make a fuss about - fire lanes, drinking - and some they blatantly ignore - canopies. But the rules are in place - and that's always a (totally unnecessary) worry driving up to the stadium in the wee hours of the AM. And the rule that is sometimes enforced - but, it seems, only on those who get there early and wait in line for 2 or more hours, is the spacing - at 8am on a big game day they will park the first cars in with very little room to spare - it's impossible not to notice that in the later hours (and in lots farther away) this is not an issue. It's interesting to me that the parking people (and I do understand that they are just following orders from above) would effectively punish their most dedicated fans. And I'd like to note that just because you park in the non-reserved areas does not mean that you don't donate money to the University. PERSONALLY, what I think Penn State needs to do - if they are determined to have "parking lots" - is to also have designated "tailgating" lots - lots, not spaces. We'll pay more if we have to (but the fan from Idaho who gets to town for one game a season should not have to pay more just to be able to tailgate - but I digress) - just give us a "first come, first park" area where we can set up our (non-award winning) tailgates without the worries. And then you can park all those non-tailgating cars where ever you want - I have a few ideas. Penn State is known across the country as a great place to tailgate - to meet up with friends, enjoy the outdoors and our great team - if they want to continue this reputation - they need to make sure that they still have tailgates going on. WE'LL BE HEADING UP TO STATE COLLEGE IN A FEW HOURS! TIME TO START THE FOOTBALL DANCE! "it's Penn State Football time; it's Penn State Football time..."
Week One. August 30th. Coastal Carolina. The chanticleers. It's an early kickoff (12pm) so we have to serve fare that stores well - and can survive (so we can survive) the warmer temperatures. Although the current forecast is predicting some rain - we're hoping to still be in the parking lots by 7am Saturday morning. Our theme is "Pluck the Chanticleers" - and we'll be serving chicken (ha ha). Week Two. September 6th. (the) oregon state university. The beavers. This must be a sort of pilgrimage for the beavers to play at Beaver Stadium. It's also an unholy opportunity for inappropriateness across the board. Such as our theme: "Stick it to the Beavers" - all foods on a stick (some finger foods as well - stop it!) "Tapas" (what? ), if you will. Week Three. September 20th. Temple. The Cherry and the White - ie, the Owls. As the Lions host Al Golden's team, we'll be hosting a group of Temple people. It's another early start. Our theme? "Tour of Pennsylvania." - it's the Italian Market meets pot pie and pierogi. Week Four. September 27th. illinois. Week Five. October 18th. michigan. Homecoming. the wolverines. To say that this is a "big game" is the understatement of the season - it would be similarly inadequate to say "big tailgate." - as you know, we've entered the tailgating competition (pick me! pick me!) - and well, we take these things kinda seriously. The theme: I'm not sure I'm ready to discuss this one yet. It's not like it's a secret (shhhh!) or anything - it just deserves it's own posting(s). Week Six. November 15th. indiana. the hoosiers. After a month away from Happy Valley - we'll be ready to return and fire up the Coleman. And we still need to decide on a theme for this game. It could be a cold day - so heartier fare is a good bet. Week Seven. November 22nd. msu. the spartans. There's a score to be settled here - PSU let msu win a game they had no business winning - this year it needs to be different. So, let's see, we need a different theme for this game... We just haven't come up with one yet. And they don't mean the Nittany Lions' explosive backfield (I hear that a daily regiment of Activa can clear that up). Accuweather (who i no longer trust, ever - but always use to get my game day forecasts) forecasts a High 80 on Saturday, with clouds and sunshine - with a couple of showers and thunderstorms possible. Rain Wednesday, Thursday and Friday night, This is (the storm formerly known as Hurricane) Fay's last hurrah - here's hoping that she travels north at a quick(er) pace. So, ESPN (and the AP) is reporting that Daryll Clark will start on Saturday. Saturday - this Saturday? How on earth can it be this Saturday? Penn State Football Practice on the Big Ten Network. I watched the "Big Ten Tonight" special fall practice from Penn State show last night. To be honest, I watched it on the DVR, so near the end of the show my thumb got a little heavy on the FF button. The beginning of the show was a little tedious - until Paterno joined the panel. At first I was distracted because his headset wasn't on properly and you could barely hear him speaking (where the heck was Red?) - but he (they) got situated and it was a pretty interesting interview - he made some comments about the Big Ten Network and Comcast that surprised me (perhaps he's more in touch than some would think) - and he basically waggled his finger at them saying - "play nice - because we'll take the ball and leave if you don't." The show basically highlighted the fact that PSU hasn't chosen a starting quarterback, has a few talented running backs, has a veteran group of receivers and O linemen - and has some questions on defense. They kept harping on the idea that the team's (and fan's) biggest question/concern this off season has been the qb contest - which is interesting because one might think that injuries, off the field issues and Joe's contract might have overshadowed that. It's not that they totally ignored the injuries - or the suspensions - it just wasn't the focus, or reoccurring theme of the show. And no one asked if this was Joe's last season. They spoke with various player - Darryl Clarke, Deon Butler, Anthony Scirrotto, AQ Shipley - to name a few. And they had Sean Lee on the sidelines discussing practice so far, how he's still contributing to the team, and how his rehap is going. That kid is pretty impressive. They also spoke to some of the coaches, Galen Hall discussed the offense and Tom Bradley (whose voice is always so much lower than I expect it to be) was pretty charismatic/specific in his interview. Steve Jones and (the brand new announcer at the BTN,) Kenny Jackson were featured as well. The announcers were really "rah rah" (I guess that was the point of the show) - which is always nice - but we're just not used to that. Also on Monday, BTN will debut "Big Ten Football Preview '08: Penn State Nittany Lions"
crikey - it's going to be 7am August 30th before we know it. PSU's first game - as you know - is against the Chanticleers of Coastal Carolina (I love it that spell check knows "Chanticleer") - and we're all set to "Pluck the Chanticleers!" We'll be parking in Lot 13 (the bits that they still let the proletariat park in) - and we'll be there when the gates open. Our menu for the day includes some fan favorites, such as "carolina pulled chicken sandwiches" and pecan pie bars (yum!). We're planning for a pretty small crowd - so let us know if you'll be stopping by. Be sure to email if you need more information/directions/contact numbers. No really - it is. The first game is a week and a half away! I've "bolded" a few interesting bits. Anyone else notice that Michael Zordich (the younger) is not on the Roster? hmmm. get more football info at GoPSUsports.com. ***UPDATE: thanks to the anonymous commenter who noted that Zordich is listed on the PDF version of the roster - at #31 (cute number). A good friend of mine (and great friend of Penn State football) recently told me a high-larry-us story. She was at the doctor's office and she handed the receptionist her credit card. A moment later, the receptionist asked "is that your husband?" She looked around her and replied "no. why?" The receptionist then said "No, the picture on your credit card - is that your husband?" My friend answered "No. 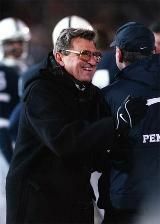 That is Joe Paterno."